Home Blog Mattress World Northwest Supports Race for the Cure! Mattress World Northwest is in the charitable spirit this autumn with exciting new promotions and philanthropic announcements. Though the air may be chilling off soon, our hearts are warm and filled with the spirit of giving. We’d like to announce an exciting new social media promotion and tell you about one cause in particular we’re passionate about supporting. Please join us in our effort to make a difference! Join us to race for the cure! Get out your running shoes and meet us at Tom McCall Waterfront Park on September 20th for the 24th Annual Portland Race For The Cure event to benefit the Susan G. Komen Foundation for breast cancer research. Since the local affiliate was founded in 1991, Race for the Cure has drawn thousands of local participants. Last year alone, Portland and Eugene residents raised more than $2.9 million dollars in the fight against breast cancer. We’re proud to be part of one of the biggest breast cancer charity events on the West Coast. We’d love for you to join out Mattress World Northwest “Mattress Warriors” team! We’ve raised more than $300 in pledge dollars so far. Join us here. 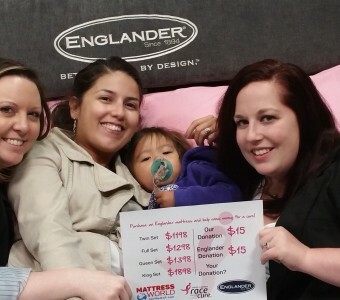 We’ve partnered with Englander mattress as official “Sleep In For The Cure” Sponsors. From now through October 31st, 2015, Englander Mattress Company and Mattress World Northwest will match every donation – dollar for dollar – on select Englander mattresses sold; so stop by Mattress World Northwest to feel what a difference a premium luxury bed can make to your night’s sleep. Englander Mattress Company is known for their eco-friendly soy visco and natural latex mattresses, as well as motion-absorbing gel memory foam that enhance circulation and relieve pressure points for a more restorative sleep. Learn more about Englander mattresses here and read Englander mattress reviews from our customers. Local residents like the idea of supporting local causes and companies who contribute to charitable causes, which is part of the reason people choose to do business with our locally owned and operated Portland-area mattress stores versus some of the big box competitors. We appreciate your business! Win dinner for two at The Melting Pot! Enter to win dinner for two at The Melting Pot from now through September 19th, 2015. Simply take a selfie on an Englander bed and tag it to the Mattress World Northwest Facebook page with the hashtag #SleepinPDX. If you don’t currently own an Englander mattress, stop by the store to visit our Sleep Specialists and give one a test drive. Don’t forget to bring your smartphone! The Melting Pot is a romantic dining establishment located in the heart of downtown Portland, just blocks from Pioneer Courthouse Square, with parking and validation at the Congress Parking Garage at 1025 SW 6th Avenue. Enjoy their signature four-course dining experience includes cheese fondue, salad, entrées cooked at the table with seasonal vegetables and dipping sauces, and chocolate fondue dessert. You’ll love this unique dining experience all the more when you win it for free!